My private situation is not conducive to blogging at all. And in fact I should take a complete break, I think at times. But then I just withdraw from my current world to escape into the illusions I have cultivated over the last weeks. 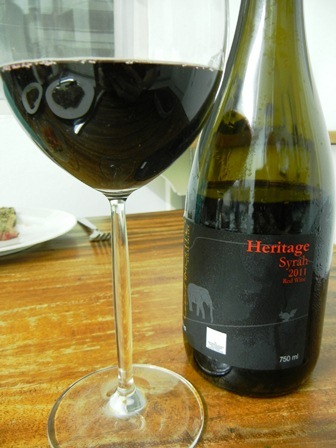 I needed to treat myself to something nice, and my choice was an obvious one, a ‘2011 GranMonte Heritage Syrah’ by GranMonte Estate in Khao Yai, Thailand. I just love the dark red colour and the intense red berry aromas. The wine is elegant, and I very muchnenjoy the balance of tannins and spicy acidity. I did not give the wine a chance to improve with cellaring but might do this with one or two bottles at a later stage. My girls had cooked dinner, spear ribbs with morning glory. The ribbs were marinated in an Asian plum sauce, and caramelized glazing was just delicious. 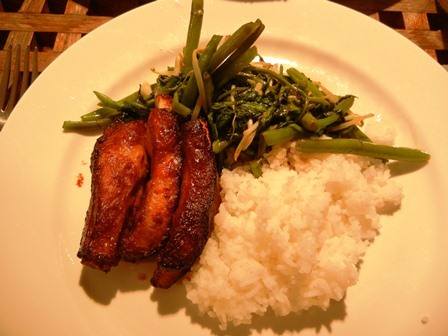 The contrast with the morning glories was stricking, and the white rice “glued” it all together. What a lovely family dinner this was. Thai wine and food with an Asian heritage. This entry was posted on Wednesday, February 27th, 2013 at 8:01 pm and is filed under food, food and wine, vineyards, wine, wine regions, wineries. You can follow any responses to this entry through the RSS 2.0 feed. You can leave a response, or trackback from your own site.